Specialty: Major aerospace and military defense contractor specializing comercial electronics and systems including Radar, satelite sensors, Marine Electronics and navigation, Air traffic control systems,missles and guidance / defense systems, radios and radio tubes. Semiconductor / Integrated Circuit manufacturer. Invented the Microwave oven. Datamatic computer. 1925 Raytheon becomes major manufacturer of "S-tube" gas-filled vacuum tube AC to DC rectifiers. 1928 Raytheon merges with American electron tube manufacturer, the Q.R.S. Company. 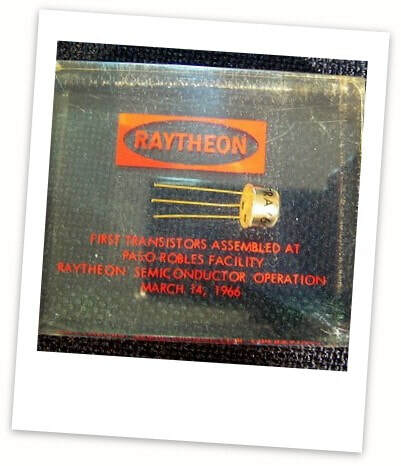 1933 Raytheon aquires transformer & radio electronic part manufacturer Acme-Delta Co.
​1940 Raytheon chosen to develop & manufacture magnetron microwave radar tubes for U.S Govt. 1941 Raytheon wins contract to supply 100 ship-based radar systems for the U.S. navy. 1945 Raytheon's Percy Spencer invents the "RadarRange" microwave oven. 1945 Raytheon aquires commerical vacuum-tube television developer Belmont Electronics. 1956 Raytheon teams up with Honeywell to form Datamatic Computer Corp.
1956 Raytheon sells all their radio and television operations to Admiral. 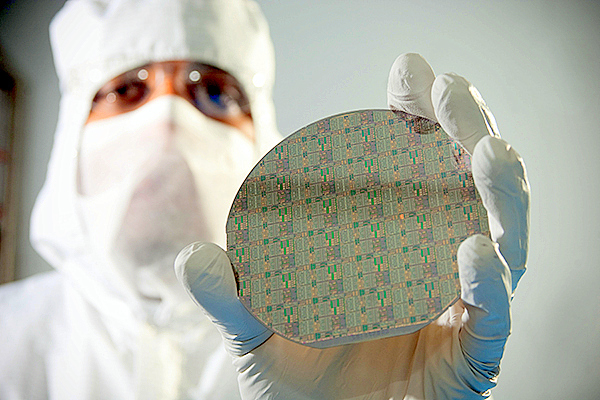 1963 Raytheon chosen to be second-source manufacturer of Sylvania's new TTL IC chips. 1964 Raytheon aquires Computer Operations from Packard Bell. 1965 Raytheon purchases Core Memory Division from Philco. 1965 Raytheon aquires Amana Rereigerator Company. 1967 Raytheon introduces first countertop Microwave oven for consumers under their Amana Brand. 1967 Raytheon selected as prime contractor of the "Patriot" SAM-D surface to air missle system. 1971 Ratheon creates their Data Systems Division, building airline reservation display terminals. 1978 Raytheon aquires word processing subsidiary Lexitron hoping to integrate into their terminals. 1984 Raytheon sells their failing Data Systems Division to Telex. 1995 Raytheon aquires spy equipment & advanced electronic gear contractor E-Systems Inc.
1997 Raytheon aquires defense business divisions of Texas Instruments & Hughes Electronics. 1997 Raytheon sells their Amana / Speed Queen home appliance divisions to Goodman Holding Co. 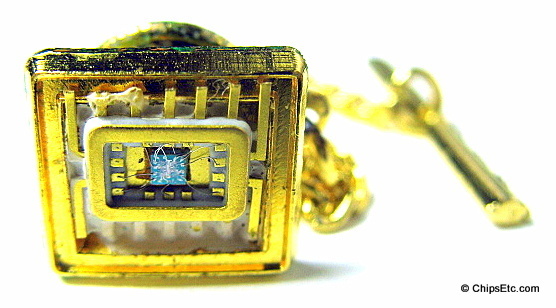 This gold-plated tie tack features an early TTL logic chip manufactured by Raytheon. The chip package never had it's hermetically sealed lid installed so clear viewing of the TTL circuitry and wire-bonding is possible. Raytheon's "RG202D" chip was a TTL (transistor-transistor-logic) monolithic integrated circuit chip featuring 4 transistors. 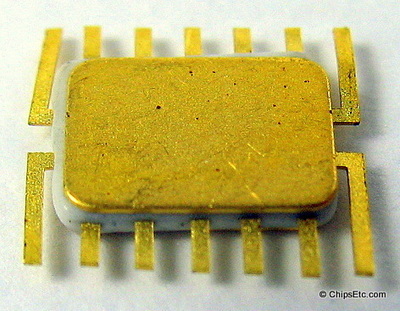 The chip came encased in a 14-pin, gold and ceramic flat-pack package. It was produced specifically for the high-specification military / space market that required higher temperature tolerances. TTL circuit technology was invented by James L. Buile of Pacific Semiconductors in 1961. In 1963, Sylvania announced the first of many chips that were to form their "SUHL" (Sylvania Universal High-level Logic) family, developed by Sylvania's Dr. Thomas A. Longo. 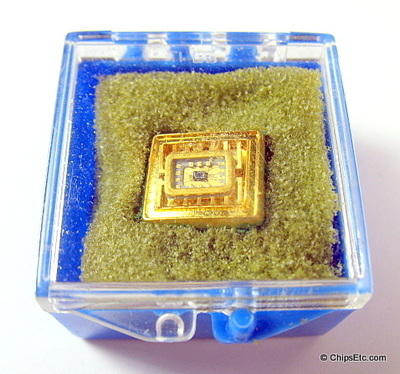 SUHL TTL chips would also be second-sourced by Raytheon (RG / RF series - such as the chip in this tie tack) and by Texas Instruments (G / F series). 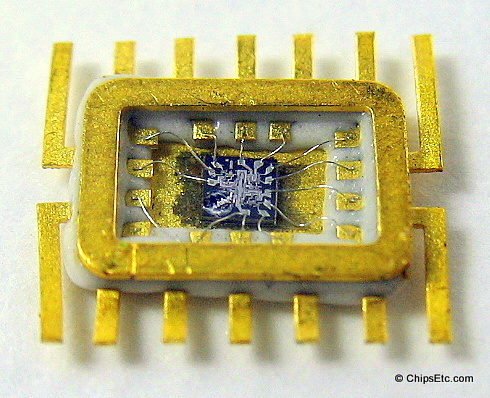 SUHL chips were the world's first commercially successful TTL chips. SUHL TTL chips were also available in gold and ceramic DIP (dual-inline) packaging.